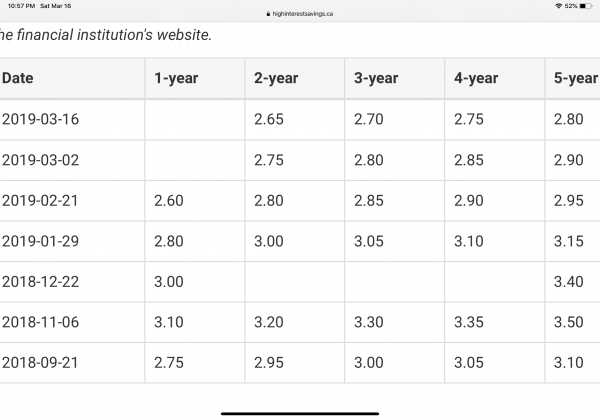 Rate for 1 year regular GIC is now down to 2.80% p.a., but RRSP and TFSA GICs are 3.00% for 1 year. Rates for longer than 1 year are slightly lower for regular GICs than for registered GICs. As usual, no advance warning of rate changes. That's why I prefer Oaken. At least the Tax Free rates appear unchanged. For unregistered deposits at Tangerine, we now need at least an 18-Mo GIC to match Motive's daily savings rate. Still, I have to give Tangerine a bit of credit for beefing up their regular GIC rates across account types, and generally moving away from the promotional interest rate "game." Such is a tiring exercise! 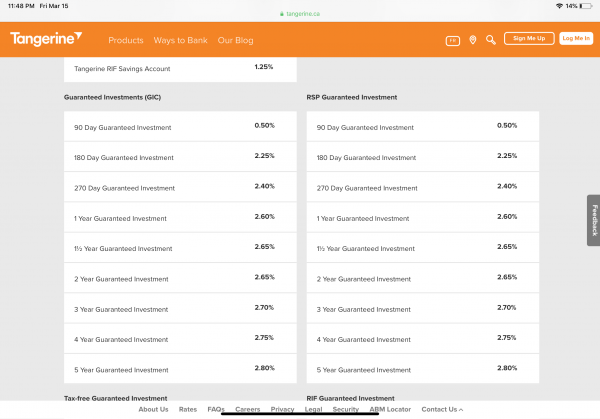 If I could earn 2.80% on a 1-year GIC versus between 2.50-3% by juggling money back and forth every quarter, that's a much easier and better way to go, in my opinion. But if you're looking for a savings account, a GIC is not the answer. I think the push to GICs is coming from the FIs rather than the consumer. EQ did the same thing. There seems to be a discrepancy in some of the posted rates and the GIC Chart. EDIT: perhaps it just changed for March 16 and the chart isn’t yet updated. I believe the latter is likely because I just checked Tangerine's chart and their 1-year GIC was 2.80% or something. I think it changed in the last couple of weeks (maybe three?). I think Peter tries to update the GIC chart at least once or twice a month (if not more). So there will be times when it is "not in sync". At any rate, Tangerine's GIC rates have gotten more competitive such that they're equal to, and better than, their silly now targeted "net new money" HISA promo rates. 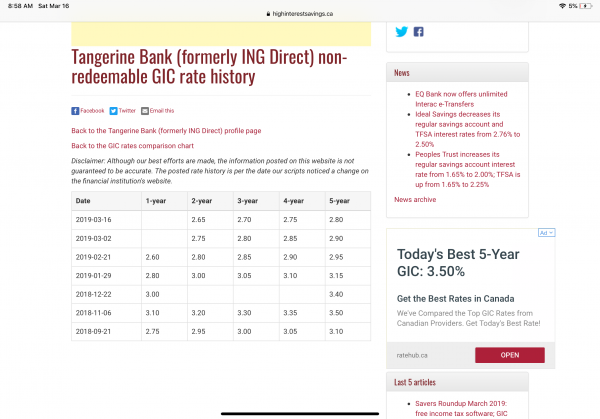 In fact, I think Tangerine's 1-year GIC rate was 10 bps better than EQ Bank's. It matches now. The chart has updated to March 16, which is what I was seeing on Tangerine’s website. Time zone lag! The 1 year is 2.6% and the 5 year is the 2.8%. I can't read the screen shots. Vision ain't what it used to be. I'd appreciate cut-and-paste if you can. You can blow up the image, but I’ll also try a paste as well..
Disclaimer: Although our best efforts are made, the information posted on this website is not guaranteed to be accurate. The posted rate history is per the date our scripts noticed a change on the financial institution's website. Not so clean, but the numbers are there. thanks very much, VAtox. I appreciate the extra effort. Thanks, Vatox, but wouldn't it have just been easier to link to the Tangerine GIC rate history page, and then pointed out in your reply the problem area(s)? Nah. I’m quite sure people know where to look. If they don’t know where to look then they can simply ask. Loonie knew where to look but wanted an easily visible post. NP.